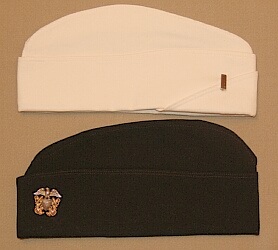 The NNC cap, introduced in 1942, was similar to the male Navy officer’s cap, but without the visor. The NNC device (1 1/8 inch in height) was placed on the crown of the cap above the chin strap. In the spring of 1944, after the NNC had received full commissions, wearing the Navy officer's cap insignia became authorized. The gold lace chinstrap was removed from the cap. 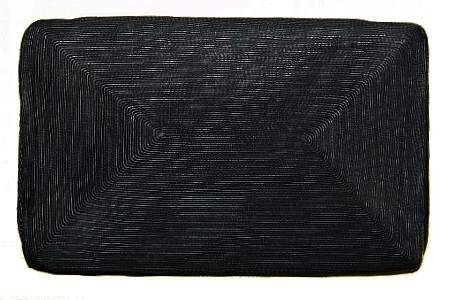 Instead, a black mohair band with a black backing for the new device was added. The cap could be worn with a white cover, a navy blue cover or a slate gray cover to go with the slate gray dress (working uniform). 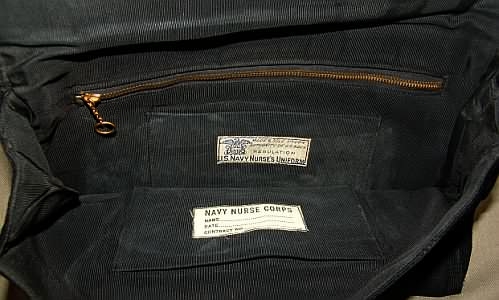 In 1944, garrison caps for Navy Nurses were introduced. They were provided in white, navy blue and slate gray and were worn with the matching uniform. A miniature Navy officer's insignia was pinned on the left side of the cap while a miniature pin-on Navy rank was worn on the right side. 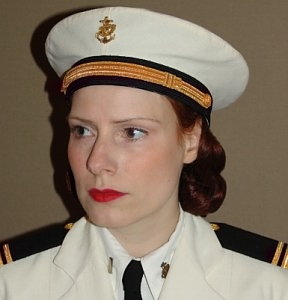 Unlike the banana shaped female garrison caps of other servicewomen's organizations, the Navy Nurse's garrison cap had a straight cut like the garrison caps for men, but with the back crown of the cap higher than the front. 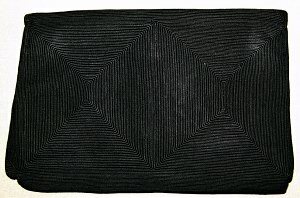 ..
Navy Nurses wore a white cap with a black velvet band across the front. 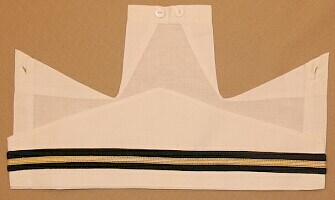 Stripes of gold braid on the black band indicated the rank held by the wearer. (A chart explaining the different rank stripes on the hospital cap can be found here: NNC insignia ) ..
. .. 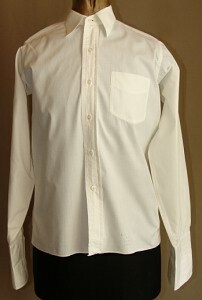 This white shirt made of sanforized cotton belonged to Navy Nurse Ilene M. Johnson. The shirt has a breast patch pocket on the left side and long sleeves with folded double cuffs. Note: the shirt is cut like a men's shirt (button closure on the left side). 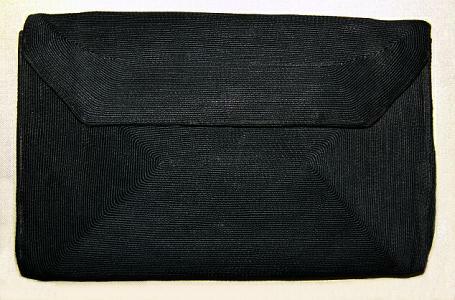 Navy Nurses received an envelope style black cordé handbag. 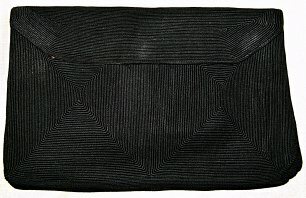 It was 12 inch wide and 8 inch high. .v Black oxford shoes were worn with the blue outdoor uniform. 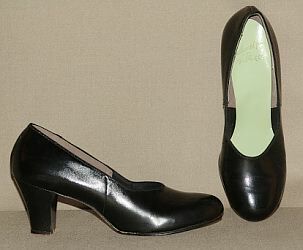 Left: Example of 1940s black oxford shoes as they were used by female Navy personnel. 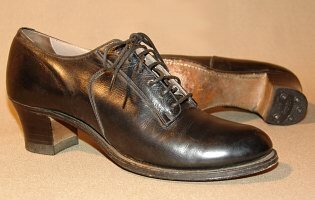 Later in the war, plain black leather pumps could be used as well. Heel height of the pumps should not exceed two inches. 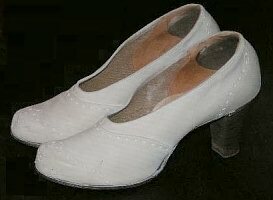 The same kind of shoes where worn with the white outdoor uniform, but white in color. 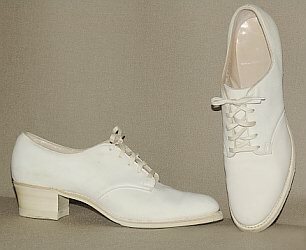 White oxford shoes with rubber heels were worn with the indoor uniform. Although the heel height of the pumps could not officially exceed two inches and needed to be plain, wartime photographs are evidence that many women actually wore shoes having higher heels and decorative styles.
. 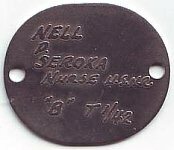 Identification Tags (Dog Tags) .. 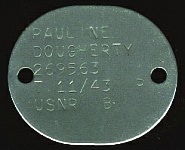 The oval shaped Navy identification tags were 1.25 by 1.5 inches in size and were perforated at each end. 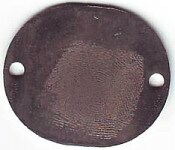 The early tags had a right index fingerprint etched on the reverse of the tag. 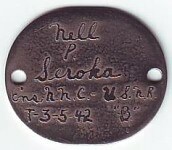 Only one tag was worn suspended from the neck by a monel wire encased in a cotton sleeve. (Monel metal was a corrosion-resistant alloy of nickel and copper, with small amounts of iron and manganese). 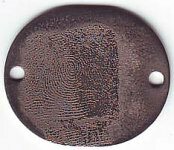 In 1943 the fingerprint was omitted. Additionally, a second tag was introduced. A new suspended cable wire provided attachment for two tags. In case of death, one tag was removed for official processing purposes and one was left on the body for positive identication. Rehulations prescribed the wear of plain white cuff links with the NNC ward uniform. Later plain gold cuff links were permitted as well.